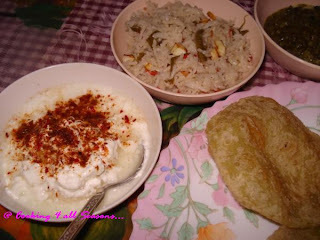 Cooking 4 all Seasons: Memories of a wonderful Feast! Memories of a wonderful Feast! In a strange place, stranger food habits, meeting wonderful people just makes up your day! Of course, that place wasn't strange for me, I have been there once before. But on the previous occasion, as a tourist and for just 3 days that we got to stay, it was a different experience. We didn't get to meet the people living there, though we got to enjoy the local foods and festivals. I came back with memories so wonderful that I fell in love with the city, with the beauty of the river flowing by and just about everything. Infact, I regaled much on the same tone to hubby dear, on recollecting my thoughts of the city of joy! But this time, our visit was more of a personal one. Since parents are living there now, its become more of a home visit. But sadly, the city has become more crowded and more polluted. And boot to that, we hadn't really wanted to venture out. We just wanted to stay at home with Amma, as Dad naturally was off to work all the days. Hubby dear was also dreaming of getting the idea of much waited vacation into action. Doing nothing, but sleeping and playing with kids. Infact, that's what we did, excepting for two short shopping trips. Dad has traveled a lot. His job necessitates frequent visits to place all over India. So different cuisines and tastes are something he is so used with. We once had a neighbour, from Orissa and had more influence from Bengal. They used to make fish so very often. That uncle used to go the fish market regularly and they used prepare for Dad especially. Once they invited us for dinner and sadly hubby dear couldn't enjoy much, as most of their dishes were sweetish and less spiced. Hubby dear takes real hot and spicy food, while Dad just loves it even if its mildly sweetish. Find a Bengali and serve him fish, well you need not go any further to satisfy one. And their different preparations, for breakfast they have stuffed puri, which are slightly sweeten. The first time we visited, we were guided by a dear colleague of Dad. He was on deputation, without his family and had to relay on local cooks for his meals. When we met him, he was in a very sorry state. He recollected his gory experience of eating stuffed puris with sweet side dish for breakfast and sweet curds for dinner. He said "Imagine ma, eating dish made with sugar! And the puris, God they also have some sweet tinge to them and eating stuffed ones at that, early in the morning, will do strange things to your body. Just be careful Ok" He is a typical Hyderabadi with hot spicy food as his second name! Little did he know that, that's what I had for breakfast and just loved every bite of it. But I didn't want to disappoint him and said its so strange that people here eat like this. All through the three days, our culinary experience throughout our stay was just enjoyable. We loved everything that was served. We took ferry down the river, couple of times and got back with memories, fit for many years to come. I was only sad that this time, especially my hubby, didn't have the same fortune as I did, some 10 years before. But one saving grace was the dinner party hosted for us by parent's wonderful neighbours. Since she moved there, Amma was giving me accounts of how this doctor and his wife, have been helping them! They have been so helpful and had taken care of so many things, that I feel Amma would've felt really difficult to manage in a new place with communication problem. It was great meeting them finally. They were such wonderful hosts. Made us feel right at home and took everything into account, it was really a great pleasure and experience meeting them. They gave us a peek into their family life and the other things in general, it was very nice getting this insight. When Dr. M and his wife, came home to invite us they got introduced to the kids, so meeting them again two days later at their place was fine. Twins didn't cry and daughter enjoyed their daughters company. They have a teenage daughter and younger one around 10 yrs old. Infact, Konda had an instant rapport with the younger one. Both the kids were such wonderful artists. The elder one's painting looked very mature and looked so much more above her age. I feel bad I didn't click any pictures of those paintings. Dad seems to have told the doctor about this blog and he was telling his wife that I have food blog. So it wasn't a difficult request to ask to click away on the food that she prepared. My, it was simply superb and so tasty. I had forewarned Mrs. M, that hubby dear eats real spicy food. So I was really glad that she prepared something in that tone, though she normally prepares with little sweetness. She had dished up so many, that I was really in awe of everything that was served. In the hurry to go, I forgot to take the camera with me. So couldn't take pictures of how it was before everybody attacked. Only when I was about to eat, I went to get the camera and clicked on the pictures. I asked her if she would mind if I upload these to my blog. She was quite happy to hear it and am I glad I did. 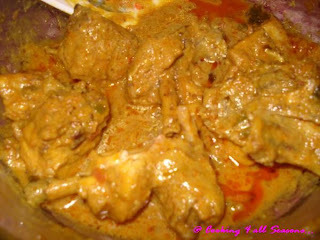 These pictures are so lovely and great, they will always remind me of the wonderful feast we had of Bengali food. They gave us a real feel of Fish with their Fish fry. Unfortunately I don't remember the variety of Fish used. Like my daughter, her kids likes Paneer too, so she prepared Mutter paneer and Veg Rice for me. Dad said Fish fry was excellent. Infact, when he was eating, Chinnu went near him and had a bite. After that we saw that, he didn't budge away from him. That's the first time he was going near Dad and also his first time eating Fish. All in all, a great feast and wonderful people! It was a great pleasure getting to meeting them and being introduced to essence of Bengal. Veg masala rice was a wonderful combination of carrot and paneer cubes prepare in a simple onion and spices. The rice were long and real soft. I believe she soaked the rice for 4 hrs. I was really amazed to know that. I normally soak the variety we get for just 15 mins. But it was really so well cooked and mixed with spices. Just enough to eat on its own. But Mrs. M had prepared split moong dal and Mutter paneer. Both were so tasty. I immediately asked her for the recipes. 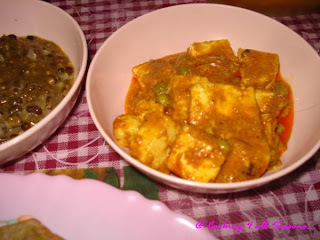 Even though we prepare Mutter paneer quite often, its so different from hers. Will be blogging the recipe soon. 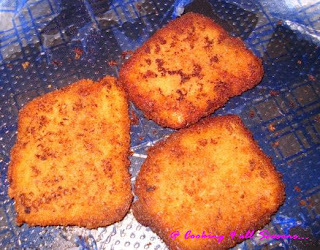 Fish fry was ultra thin slices of sliced fish marinated in lime juice, ginger, garlic and green chillies. Marinate for 4 hours, then rub on Besan / Gram flour and then on bread crumbs Then refrigerate overnight or for 3 - 4 hours, Infact they get these things done and always store it and use whenever they want. Mrs. M showed me the lovely looking dried fish slices. Chicken gravy was something new to me. I was able to take pictures of only left our chicken gravy but still it looked great! Its a preparation with tamarind, which is very new to me. Should try it out sometime. She also served peas stuffed puris, those that I was talking about in the earlier part as the breakfast item. Wow, it was great eating them again. I normally make peas parathas. But have never tried out peas puris. Will be preparing these soon, what with fresh peas over flowing in the market. Update, I just realised the name somewhere ringing in my mind. But couldn't really get it out. Satya enlighten me on this, so I searched and found the below from wikipedia, which is a great source of information in sharing. 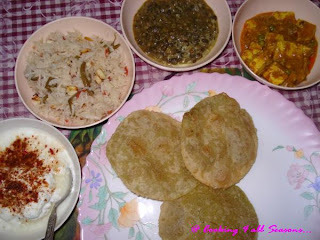 A luchi as in Bengali, is a deep-fried flatbread made of wheat flour that is typical of Bengali cuisine. 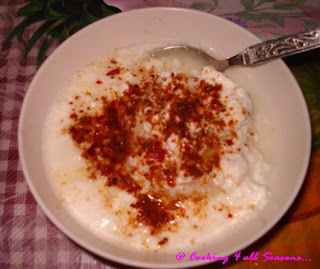 In order to make luchis, a batter is prepared by mixing fine maida flour with water and a spoonful of ghee, which is then divided into small balls. These balls are flattened using a rolling-pin and individually deep-fried in cooking oil or ghee. A typical luchi will measure 4-5 inches in diameter. They are usually served with curries or gravies. If maida is substituted with atta, it is called a poori. 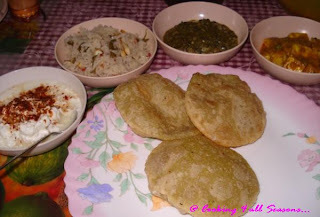 Luchi that is stuffed is called kochuri; kochuri stuffed with mashed peas (koraishutir kochuri) is one notable variety. Looks like I had the most notable variety, great! Then came the Dahi Bada. Bengalis are know for their Misti Dohi, and I am no stranger to this name. Infact I think I remember this name from childhood, hearing it so often from Dad. Dad was in Patna around the time I was born. He then went back to the capital to do his PGs. He got his affinity to this city from the short span he happen to stay there as a student. From his many references to this beautiful cuisine, Misti Dohi featured more. But Dahi Bada was a milder version which was aptly served with chat masala and Sweet chutney. Both added so much taste to the Bada. Or Vada that we call, is a one made with Urud dal and dahi is added just before serving. Garnished with Chat masala along with sweet chutney, was an ample way to end a handsome feast! Since I wasn't involved in cooking any of this wonderful feast, I had taken Mrs.M's permission to use them on my blog. I had a real experience of wonderful food and a great pleasure meeting them. I am so thankful that they are there to help Amma, in the many things that she needs on daily basis. God bless them! Hope you enjoyed this, as much I as did, recollecting the wonderful memories associated with this.